Take a walk in the bulk section of a health food store, and you’ll likely see yellow flakes, granules, or powder called nutritional yeast. Don’t be fooled by the name, as it is actually inactive yeast made from beet molasses and sugarcane, and you can’t use it for baking. It is a strain of Saccharomyces cerevisiae, or sugar-eating fungus, where yeast cells use sugar for energy. Although vegans and vegetarians admire nutritional yeast for its nutrition, almost anyone would appreciate it for its savory taste, and nutty and cheesy flavor. It is often used to imitate cheese in certain vegan dishes, while also thickening sauces and dressings. Since yeast cannot produce vitamin B12, nutritional yeast is likely fortified with it when the vitamin is listed on a nutrition label. That’s alright though, as the combination of B vitamins and other nutrients make it a fantastic superfood that is gluten-free. It is an excellent way to boost immunity, improve digestion, promote healthy hair and skin, prevent birth defects, and more. 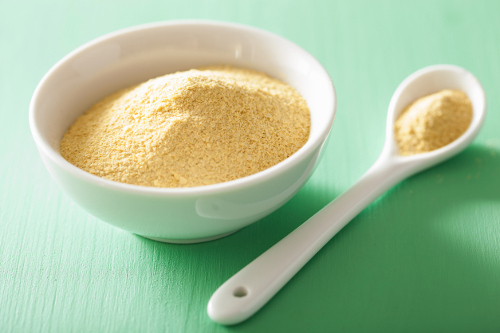 Read on to discover why nutritional yeast may be the perfect addition to your next meal. Want to know how nutritional yeast is made? The production is actually a five-step process. The production of nutritional yeast begins with a pure parent yeast culture of Saccharomyces cerevisiae. The yeast seed will grow in a sterile environment, and later it is transferred to a container for cultivation. In cultivation, the control of temperature and pH of the yeast are important to create optimal growth. The good conditions allow the yeast to obtain a purified medium of air and nutrients. After the growing process, fermented yeast liquid is passed through a process that will concentrate yeast cells. The result is an off-white liquid known as nutritional yeast cream. Pasteurization of the cream is a process that makes the yeast inactive. This is where fortification occurs, and nutrients like vitamin B12 are added to help enhance the nutritional profile of nutritional yeast. Finally, the yeast is dried and sized into powder, flakes, or granules in a similar way as cornmeal. Studies conducted by Louis Pasteur led to a better understanding of yeast as a living organism. Beginning in the 20th century, this led to the commercial production of nutritional yeast. Nutritional yeast, along with blackstrap molasses, wheat germ oil and wheat germ, and yogurt, were once part of the four cornerstones of the health food movement. They were known as reliable superfoods since they were primary sources of minerals and B vitamins. Nutritional yeast is considered to have the ability to biotransform nutrients at an accelerated rate where the body can readily use the nutrients. It is important to differentiate between nutritional yeast and brewer’s yeast. Nutritional yeast is far superior to brewer’s yeast and contains a higher amount of B vitamins than wheat germ and other natural foods. Nutritional yeast also contains important food factors like SOD (superoxide dismutase), glutathione, RNA/DNA, beta-glucans, amino acids, lipoic acid, trace minerals, polysaccharides, GABA (gamma-aminobutyric acid), B-complex vitamins, and more than 40 proteolytic enzymes. What are nutritional yeast nutrition facts? It is considered to be a good source of vitamins for vegans and vegetarians that often fail to get enough B vitamins in their diet. It is important to note that B vitamins are only found in the fortified form of nutritional yeast. You can also purchase nutritional yeast that has not been fortified, though it may be a good idea to blend the two for optimal benefits. Two tablespoons of fortified nutritional yeast also contains 8 grams of protein and 4 grams of fiber. Fortified nutritional yeast contains a massive amount of vitamins B1, B2, B3, B6, and B12, folate, as well as some vitamin B5, zinc, iron, manganese, copper, and magnesium. Keep in mind that the body can only absorb so much of any one nutrient at one time. So, it is a good idea to add fortified nutritional yeast to each meal to help the body absorb B vitamins throughout the day. The following is a comprehensive nutrition chart with information for two tablespoons of fortified nutritional yeast or 16 grams of the food. What are the health benefits of nutritional yeast? For starters, it is a complete protein source and contains nine of the 18 amino acids that the body cannot produce. It is especially useful for vegans or vegetarians that struggle to get enough protein in the diet. Protein deficiency can lead to difficulty building muscle mass, a sluggish metabolism, fatigue and low energy levels, poor concentration, slow wound healing, low immunity, moodiness, and blood sugar changes, as well as muscle, joint, and bone pain. Nutritional yeast also enhances immunity, benefits digestion, promotes healthy hair and skin, aids in a healthy pregnancy, prevents birth defects, and provides antibacterial and antiviral properties. The following are five detailed health benefits of nutritional yeast to help understand more about this inactive yeast product. Nutritional yeast contains the compounds trehalose, beta-1,3-D-glucan, glutathione, and mannan—all linked to improved cholesterol, reduced risk of cancer, and enhanced immunity. The many vitamins and minerals in it also help prevent nutrient deficiencies and help with wound healing and tissue repair. Beta-1,3-D-glucan is also considered a type of fiber that may benefit immunity and reduce cholesterol. Nutritional yeast is considered the fourth most-prescribed herbal mono-preparation in Germany due to its antibacterial and antiviral properties. It is only behind Ginkgo biloba, St. John’s wort, and horse chestnut. Since nutritional yeast does not have an association with Candida albicans, this inactive yeast is actually beneficial for chronic candida symptoms. It is also beneficial against Salmonella, Staphylococcus, and E. coli (Escherichia coli) infections. German monographs show that nutritional yeast is a good medicinal choice for loss of appetite and diarrhea. The probiotics in it also benefit diarrhea patients. It is also a good choice for people with lactose intolerance since it can be used to replace cheese or dairy in certain dishes. A study published in the Oxford Journal suggests that Saccharomyces cerevisiae expresses isomaltase and sucrase activity but no lactase activity. As a result, it may improve malabsorption in patients with a sucrase-isomaltase deficiency that unintentionally or intentionally consumes sucrose. Nutritional yeast is an exceptional source of B vitamins, which benefits skin, hair, and nails. Vitamin B5 and biotin, in particular, are great for healthy skin, hair, and nails, and they also decrease signs of aging like skin spots and redness. The vitamin B3 it contains can also treat chronic acne and benefit the skin overall. Nutritional yeast is a great choice for pregnant women since it is high in folate. Getting enough folate during pregnancy may help prevent birth defects like spina bifida. It is good to consume more natural foods with folate like nutritional yeast since it is not possible to consume too much folate from food. However, getting too much folate in supplement form may mask a vitamin B12 deficiency. As mentioned, you can find nutritional yeast is in the bulk or supplement sections of a health food store. It is perfect for people that are lactose intolerant. You can add it to smoothies or sprinkle it on pasta, soups, salads, popcorn, garbanzo beans, and mashed or baked potatoes. Some people compare nutritional yeast to Parmesan cheese in its flaked form. Store nutritional yeast in a refrigerator or a cool, dark place where it will last up to two years. The following are a couple of easy nutritional yeast recipes to get you started with it. Combine well in a high-speed blender, and serve in a large glass. For the cheese sauce, soak the cashews overnight or for at least an hour in a glass container, then rinse and drain. Place the carrots and potatoes in a medium pot and cover with water. Bring to a boil and reduce to medium heat. Simmer uncovered for 10 to 15 minutes and drain. You can also steam the vegetables if you prefer. Transfer the carrots, potatoes, and cashews to a blender. Then add coconut oil, lemon juice, water, nutritional yeast, a half teaspoon of salt, vinegar, and garlic, and blend until smooth. If it’s too thick, add some more water to help it blend. Taste the sauce and add more salt, if desired. The sauce will keep in the fridge for up to a week. This sauce is great with tortillas chips, potatoes, or gluten-free pasta. In summary, nutritional yeast has antiviral and antibacterial properties, boosts immunity, improves digestion, promotes healthy skin and hair, prevents birth defects, and more. Fortified nutritional is loaded with B vitamins, including vitamin B12. Also, other than a possible allergy, there aren’t any other known risks. Researchers have indicated that completely deactivated and pasteurized nutritional yeast is safe, and it won’t lead to yeast overgrowth to someone that consumes it. It also benefits people with sensitivity to active yeast found in bread since it does not contain Candida albicans. On the other hand, whenever you try a new food like nutritional yeast, it is best to start with small amounts to see how your body reacts to it. But, chances are, your body will be fine with it, and nutritional yeast will be a new nutritious addition to your healthy diet. “Nutritional Yeast Flakes (Kal) 2 Tablespoons Nutrition Facts & Calories,” SELF NutritionData; http://nutritiondata.self.com/facts/custom/1323565/2, last accessed June 29, 2017. Liddon, A., Oh She Glows Every Day: Quick and Simply Satisfying Plant-Based Recipes (Toronto: Penguin Canada Books Inc., 2016), 251. Herbrecht, R., et al., “Saccharomyces cerevisiae Fungemia: An Adverse Effect of Saccharomyces boulardii Probiotic Administration,” Clinical Infectious Diseases, June 1, 2005; 40(11): 1635-1637, doi: 10.1086/429926.